Most oxygenator manufacturers integrate arterial filters and oxygenators — offering better technology to improve patient care. 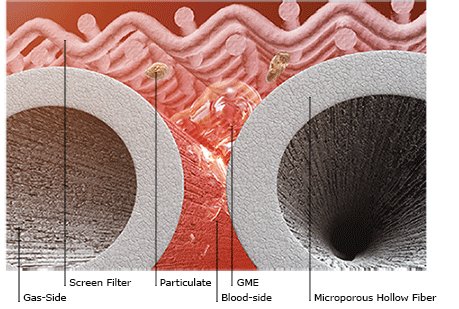 The new integrated arterial filters offer the same functionality of a traditional filter — trap particulate and purge gaseous microemboli (GME). But some, like the CAPIOX® FX Oxygenator, accomplish these functions in simple but innovative ways. Methods to remove GME from the circuit with integrated arterial filters varies. First-generation designs simply attach the arterial filter to the oxygenator. These first-generation designs use the traditional vent to purge air to the venous reservoir. The CAPIOX FX Oxygenator is unique because of its self-venting function which removes GME through the microporous hollow fibers — it does not require purging through a vent port. "The self-venting method of GME elimination separates the emboli from the blood in the circuit rather than returning them to the venous reservoir for removal." A 32 micron screen filter surrounds the fiber layer of the CAPIOX FX Oxygenator. Particulate microemboli in the blood are trapped in the filter mesh while gaseous emboli remain inside the oxygenator and in contact with the hollow fibers. During bypass, the blood-side pressure is higher than that of the gas-side pressure of the inner lumen of the hollow fiber. Driven by the pressure differential, gaseous emboli enter the inner lumen of the microporous hollow fibers. Once the emboli enter the inner lumen, they are eliminated via the gas outlet. The self-venting method of GME elimination separates the emboli from the blood in the circuit rather than returning them to the venous reservoir for removal. First-generation integrated arterial filters use a vent (or purge) port to remove the GME. If microemboli enter the perfusion circuit, they are trapped by the arterial filter, and then exit from the vent (purge) port with blood flow shunted to the venous reservoir. "The design of the Terumo CAPIOX FX Oxygenator with its integrated filter optimizes the performance of the hollow fibers to self-vent gaseous microemboli," says Carl Freytag, Senior Clinical Specialist, Terumo Cardiovascular Group. Figure 1 shows a concept of the self-vent function. "The integrated screen filter efficiently traps the gaseous microemboli, maintaining them in close proximity to the large surface area of micro-pores of the hollow fibers," Carl adds. "The blood-side to gaseous-side positive pressure gradient effectively drives the emboli through the micro-pores to the gas-side of the hollow fibers for immediate removal from the cardiopulmonary bypass circuit. “It is a simple bubble movement through the hollow fiber's micro-pores," he adds. Although the self-venting method of microemboli removal in the CAPIOX FX Oxygenator is different than a traditional purge, clinical studies have shown it to be just as effective. 3, 4 More important, removing GME via the gas phase helps eliminate GME from the circuit rather than recirculating them to the venous reservoir. Figure 1: Illustration of self-venting purge through the oxygenator hollow fiber. 1. Riley, J. Arterial Line Filters Ranked for Gaseous Micro-Emboli Separation Performance: An In Vitro Study. J Extra Corpor Technol. 2008; 40:21-26. 2. De Somer, F. Impact of Oxygenator Characteristics on Its Capability to Remove Gaseous Microemboli. J Extra Corpor Technol. 2007; 39:271-273. 3. Preston, et al. Clinical Gaseous Microemboli Assessment of an Oxygenator with Integral Arterial Filter in the Pediatric Population. J Extra Corpor Technol. 2009; 41:226-230. 4. Gomez, et al. Evaluation of air handling in a new generation neonatal oxygenator with integral arterial filter. Perfusion. 2009; 24(2):107-112.